It is noteworthy to mention because being aware of the nature of the story, I approached this production with considerable trepidation but was relieved to see that it is not a violent reenactment of hideous criminal acts but rather a more subtle and powerful expose that reveals the truth of what is happening. Although the dialogue is very well written, I found that while Sandra Delgado as Brenda’s mother, Yoli, and Charin Alvarez as Yoli’s friend, Marisela, had moments of greatness, they struggled at other times to hit just the right level of emotion. However, these performances are early in the run and are likely to evolve over time because both woman have the chops to nail every second of their demanding roles and will, no doubt, hit their stride. Cher Alvarez is perfectly engaging as Brenda, expressing a palpable “joie de vivre” and a trustworthy nature that illustrates the vulnerability of the innocents who are specifically perused by their predators. Karen Rodriguez skillfully dealt with her range of emotions as the friend and co-worker, Ivonne, who has secret torments of her own. Mari Marroquin has a small but very effective scene as Zaide the seasoned factory floor “mother” who is getting ready to “age out” of this system that eats up the young and spits out the old. Key moments are punctuated by often haunting musical interludes led by the velvety evocative voice of Laura Crotte with her mellow acoustic guitar accompaniment. The action takes place on the fairly bare set design of Regina Garcia in collaboration with lighting designer Jesse Klug and Rasean Davonte Johnson. Projected film images very effectively transport us from location to location and utilize typography to indicate changing time periods. The play is destined to be hailed as an important work that will illustrate the darker side of the end of the second millennium. It reveals the negative effects of industrialization that clearly has not evolved but rather fails to protect workers and continues to exploit desperate laborers. “La Ruta” cannot be characterized as uplifting but neither is it exploitive or prurient. It is actual human drama on a personal level based on real life experiences that we can relate to, then walk away feeling informed. Perhaps people will be inspired to stand up for those who need our support or protection while taking a moment to remember those who are all but forgotten. 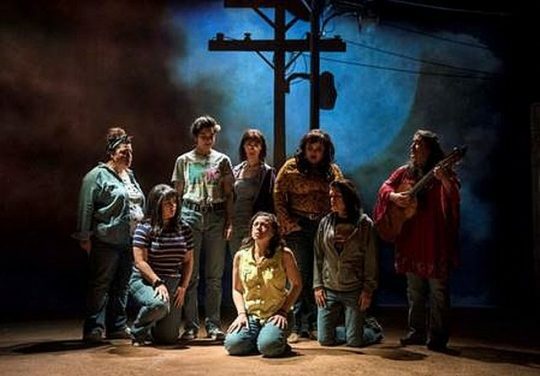 DETAILS: “La Ruta” is at Steppenwolf’s Upstairs Theater, 1650 N. Halsted Street, Chicago, through Jan. 27, 2019. Running time: about 90 minutes with no intermission. For tickets and other nformation call (312) 335-1650 or visit Steppenwolf.